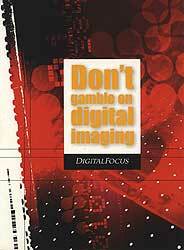 Read our coverage of DigitalFocus at Comdex and Digital Focus at PC Expo. The Olympus C-3030 Zoom is a 3.34 megapixel digital camera with 2048 x 1536 maximum resolution. It features a 3X Zoom [32-96mm 35 mm equivalent] all-glass lens, USB and serial connectivity, an infrared remote (very cool), 15 resolution modes and 6 flash modes. Since this camera has a 32MB SDRAM buffer, it can shoot at 3.5 frames per second. That's nearly 25 times faster than my Mavica! It can record QuickTime movies with sound and retails for $999. Fuji has recently introduced both the FinePix 4700 Zoom (consumer) and FinePix S1 Pro (professional) digital cameras - the first products to incorporate Fujifilm's new Super CCD image sensor technology. The .58-inch Super CCD used in the FinePix 4700 Zoom has a whopping 4.3 million-pixel image resolution and is capable of creating pictures as large as 2400 x 1800 resolution. Shutter speeds on this camera range from 1/2000 second to three seconds, with an adjustable ISO sensitivity of 200/400/800. It can play back up to 80 seconds of AVI video with sound with the included 16MB SmartMedia card. 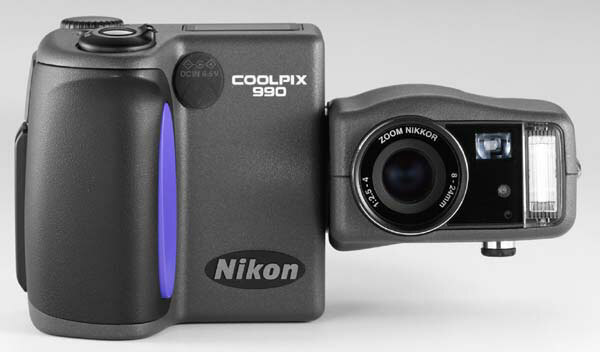 For their latest version of the 900 series digital camera (see our Nikon 900 review), the Coolpix 990, Nikon has combined a 1/1.8-inch, 3.34 million CCD with a 3x Zoom-Nikkor F2.5-4 8-24mm [38-115mm 35mm equivalent] macro lens capable focusing on an object as close as 0.8 inch. Excellent! The camera has a maximum resolution of 2,048 x 1,536 along with the lower resolutions of 1,024 x 768, 640 x 480 and the 3:2 ratio of 2,048 x 1,360. 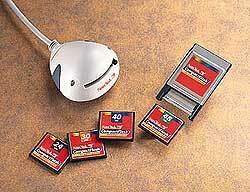 Images can be stored in either uncompressed TIFF or compressed JPEG Media on CompactFlash media. SanDisk Corporation's SDC-FB4/8/15/30/40/48/64/96 and Lexar Media Corporation's 4X (8MB) are compatible. 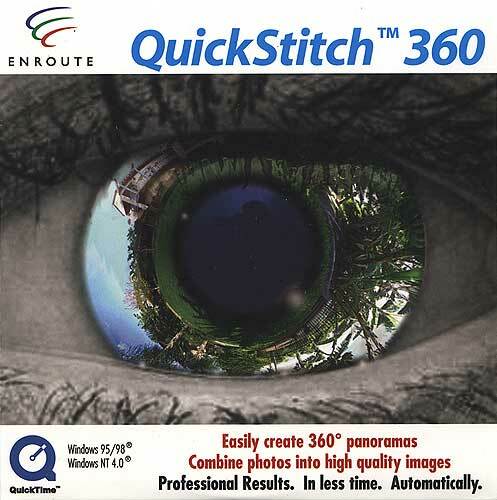 Enroute Imaging displayed their QuickStitch 2.0 and 360 products and the new PowerStitch which was unveiled at DigitalFocus `99 at Fall Comdex. PowerStitch is geared toward professional and prosumer "stitchers" to create large size, high resolution panoramas. It is capable of creating huge murals, banners and posters. For Fall Comdex, 75 2.5 megapixel images were combined into a single, 500 megabyte panorama which was displayed on the side of a semi-trailer. PowerStitch retails for $399. SanDisk has shipped more than three million CompactFlash memory cards last year making it the most popular solid-state digital "film". 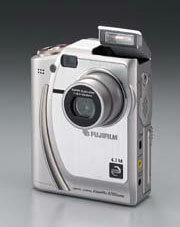 More than 110 digital cameras have been introduced that use CompactFlash technology. CompactFlash is used in handheld computers, photo printers, Internet music players, medical monitors, set-top boxes, audio recorders and auto PCs. CompactFlash memory cards range in capacity from 4 to 128 megabytes. Higher capacity 160 MB and 192 MB cards will start shipping in a few months. SanDisk offers connectivity solutions for CompactFlash memory cards with the ImageMate external CompactFlash reader/writer drive, available in both parallel port and USB versions. I have used SanDisk CompactFlash memory without any problems, in several different cameras, and have even used it to transfer large files between laptops like a "giant" floppy disk. Zing announced that they will be integrating PictureIQ technology into their photo community site by early second quarter 2000. This will provide an powerful image editing, enhancement, and creativity tools to consumers over the Web, without additional software or downloaded plug-ins. Zing's goal is to provide a convenient way to help consumers to easily improve their pictures. 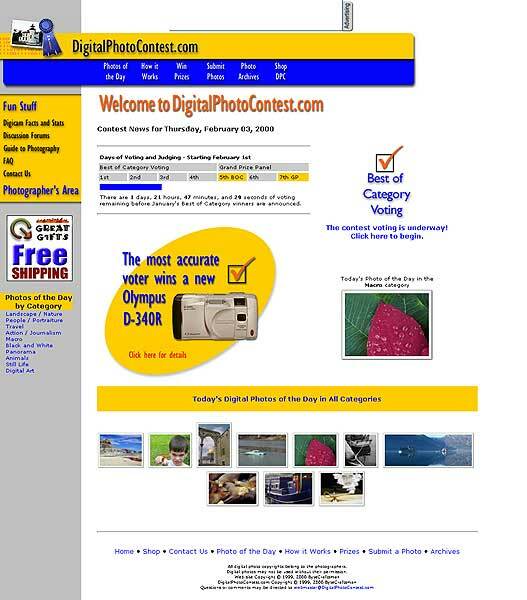 EZ Prints, an Internet-based photofinishing service for digital images, announced that DigitalPhotoContest.com has joined the EZ Prints' Partnership Program as a Silver member. The popular digital photography contest company is the first partner to fully launch EZ Prints' services on its site. Services include point-and-click selection of online images to create 4x6, 5x7 or 8x10 print. Photo gifts, such as photo mugs, t-shirts, photo puzzles, mouse pads can also be ordered. Sony promised to have some new announcements later this week and they did - Read our coverage about the new Sony Mavica MVC-FD95, Cyber-shot DSC-S70, UP-DP10 Printer and the VAIO C1XS PictureBook.